The dogs in our kennel consist of five magnificent Samoyeds. Our boys are Lightning and Nimbus (shown below leading our sled dog team) and our young puppy Riegel. Our two females, Stormy and Dixie, are also great workers in harness. 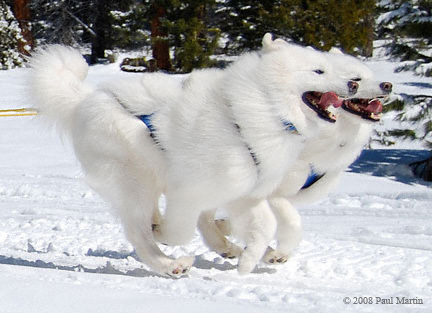 Our purebred Samoyeds come from the Wolf River bloodline. This long established kennel is well-known for producing sound dogs with gentle temperament, longevity, and spectacular movement. During the winter, our dogs often compete in skijor and sled races, and cover hundreds of miles while dog sledding for fun. In summer, they backpack, hike, pull a cart, and work on agility equipment while building muscle and stamina for the racing season. We show our dogs on a limited basis, and it gives us great pride to exhibit our hard-working companions in the conformation ring. Our dogs have ascended to pinnacle positions in the working and show arenas.